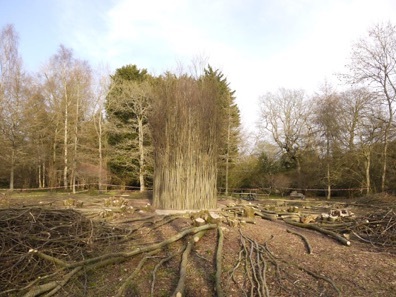 Located in Silk Wood within Westonbirt Arboretum, the lime is coppiced at intervals of around 20 years. 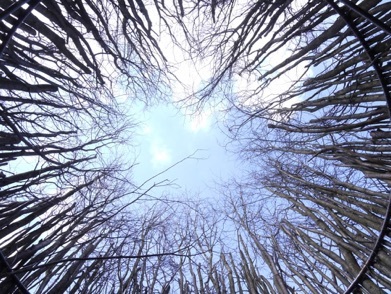 Coppicing is a method of cutting a tree back periodically, allowing healthy, multiple stems to re-grow and keeping the original tree alive. 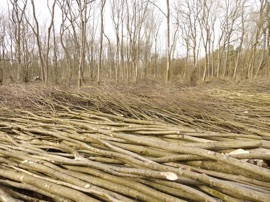 The traditional woodland management skill of coppicing has allowed the lime to live for so long. Experts agreed in the 1990s that the size of the lime clump and its pattern of growth meant the tree could be as much as 2,000 years old. 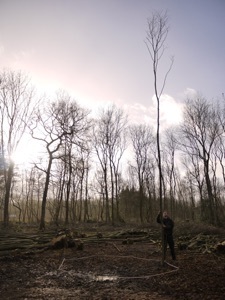 The tree was last coppiced in November 2012. The stems have provided materials for local craft and trades people across the centuries. It is the cut material from this process that has been used to form the sculpture. On coming across this Small Leafed Lime for the first time I was struck by the shear bulk of material on the ground following the coppicing of this ancient tree. My plan was to work with this great physical mass, to give a sense of the age and scale of the tree that was not apparent from the piles of cut stems on the ground. The coppiced Lime tree and the wood it produces, is in an unfamiliar or unexpected form for an ancient tree. 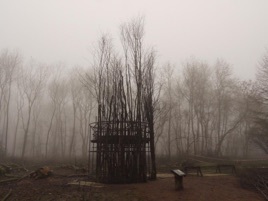 If all this timber was put together it would add up to a sizable tree; the sculpture re-configures the cut wood into an equivalent vision of a very large single stemmed tree of a similar age. Stood vertically one against another, the cut Lime branches form a circle of approximately 15m in circumference or 5m diameter. This gives a sense of what people may expect from a 2,000 year old tree, but drawing attention to the very different form of the coppiced Lime, that is in effect, an ancient tree in disguise. Trees of this age are usually hollow. The sculpture can be experienced from the inside where the supporting steel structure can be clearly seen. 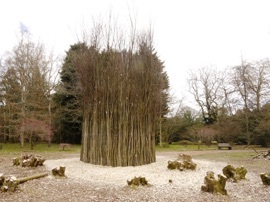 The sculpture is sited at the edge of the existing coppiced stools, to form a close relationship to the tree that will change as the fresh Lime shoots re-grow, eventually engulfing the sculpture. The sculpture is temporary and is expected to last for about five years.